Antony King Interview, Part 2. Antony King Interview, Part 1. Oxford, UK - The Depeche Mode Global Spirit Tour is currently scheduled for over 90 dates in stadiums and large-scale venues around the world. It started in Sweden in May 2017 and will finish in Brazil in March 2018. Front of House Engineer Antony King is taking two Solid State Logic L500 Plus digital live consoles on the road with him, supplied by UK rental company Britannia Row Productions. "The SSL is the only serious choice out there," Says King, who auditioned several consoles before settling on the L500 for the tour. 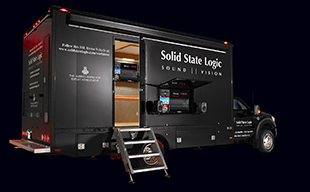 "With a company like SSL you're not taking risks... You want something that will work every day, sound good, and travel on the truck... So SSL is the only choice, I think, at this point." The band plays a mixture of material from both its 14th studio album, Spirit, and its incredible legacy of seventeen UK top ten albums and over 100 million worldwide records sold. The set list also includes the Bowie track Heroes - reported to be the song that Dave Gahan was heard singing in a Scout hut by founding member Vince Clarke, when he was asked to join the band. Original members Martin Gore, Dave Gahan, and Andy Fletcher are all in the show, along with touring members Christian Eigner (drums) and Peter Gordeno (Keyboards, bass, backing vocals). The whole show uses nearly 100 inputs, with the biggest contribution to that being Eigner's drum kit, with about 30 channels all to itself. "There are a lot of drums," notes King. "Lots of toms, two kick drums, two snares, two hats, and cymbals everywhere." Gordeno uses three keyboards, including a Moog for many of the distinctive Depeche Mode basslines. Fletcher has two keyboards, as does Gore, who also provides four outputs from his guitar rig, comprising parallel Rivera and Kemper amps. "That's quite nice," says King. "You can do some really crazy things in the Kemper and keep the Rivera as the solid guitar sound. Depending on the song you can go for more crazy, or more guitar." For most shows, there are two SSL L500 consoles at front of house, running in Expander mode (effectively as a single 'stretched' console). This allows King to move around a greater range of faders, but importantly also means that his assistant can jump onto the second surface as needed - to manage broadcast feeds and so on. Those consoles are fed by SSL ML 32.32 Stageboxes via a redundant optical connection using SSL's Blacklight concentrated MADI technology. The Monitor console uses the analogue mic amp splits from the SSL Stageboxes. In terms of console setup, King keeps the main mix simple - using input channels and VCAs, and taking advantage of the extra real estate afforded by using two L500s. He also uses a good number of the special SSL Stem Groups, both as aux busses with their own independent processing paths that do require return channels, and as sub-mixed sets of around 16 stems for video and broadcast feeds. King points out that for some, the SSL Live consoles may require a new approach - mainly because of its lack of limitations. "The thing with the SSL is that it's so modular you can do anything," he explains. "A lot of desks previously had a fixed number of channels and a fixed number of auxes, and so on. You had to work around that - finding interesting ways of doing things within those limitations.... This console can do anything you want... It never says no." "I really like the fact that the snapshots are super-easy to use. So many consoles have extremely complicated systems that drive you nuts. The SSL snapshot system just works... You don't want to be twitching before you hit a button, wondering if it's going to do something you don't want it to do." He is also making good use of the L500's internal FX Rack, even though he still maintains a healthy outboard rack for a few of his old favourites. The console's internal reverbs feature prominently in the show, as well as the Enhancer and VHD Saturator effects. "And of course, being an SSL, you have the Bus Compressor on-board," he says. "That sounds amazing 'in-the-box', so I use that a lot... As it has done with so many mixes over the years, it just sticks things together!" Antony King, mxing Depeche Mode on SSL Live. All gating and most of the dynamics processing on the show uses the standard SSL Live channel processing. "There's no need to over think it," he explains. "All the internal stuff is good, so I don't feel the need for any extra on a lot of it. "Having two insert points is great, too. I can run outboard on one and internal FX on the other and punch in and out if I need to." King is also using the second insert point as a feed to record a version of every show with all effects in place (As well as a clean direct output): "You can put that output anywhere you want in the signal flow, so I just touch-and-drag it to the end and it picks up the entire chain." This can be useful if, for example, a broadcaster requests a mix of the show at short notice. "It means I'm half way there already," he explains. "I can just jump on the bus, put my headphones on, and start with a pre-EQ'd, pre-compressed mix." According to King, there are many operational reasons why SSL Live is a great choice for one of the biggest international tours this year, but one particular reason supersedes all of those: "Of course, it also sounds great" he says. "Which was the whole point of choosing SSL in the first place."